Always in Touch – Are you worried about leaving your baby or child alone or not hearing them when they wake up? 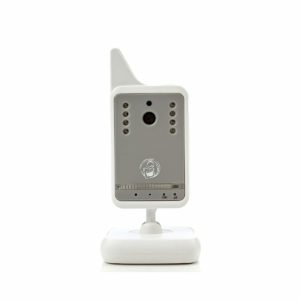 Using your BabyWombWorld baby monitor you can now keep an eye and ear on your little one wherever you are all the time! No need to stress or to be worried as a parent. 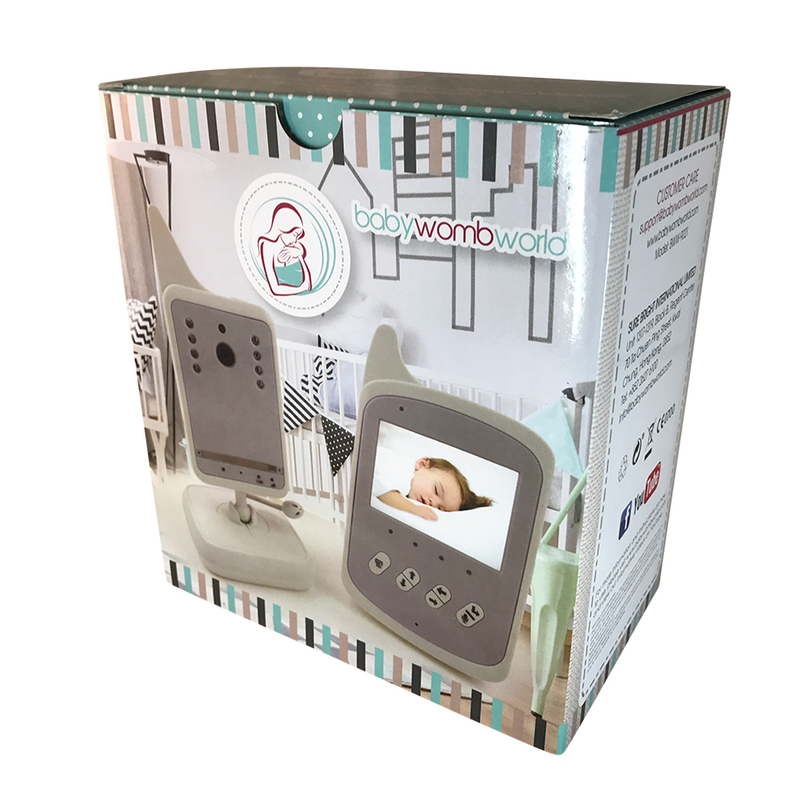 Take it with you when you go to visit your friends, this monitor is great to watch your baby while he/she sleeps in one of their rooms. 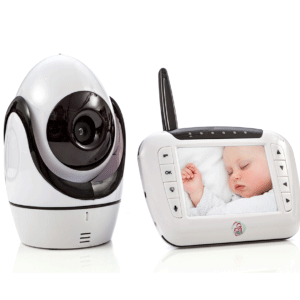 Fantastic Features – BabyWombWorld Baby Monitor has a transmission RANGE that will cover most of your house. 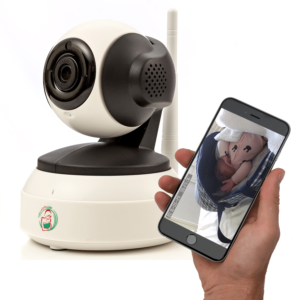 So you will easily be able to watch and listen to your baby wherever you are in or outside your house. With NIGHT VISION this camera has great picture quality day and night. The TWO-WAY audio communication makes it possible to listen and talk to your little one if needed. Super Easy to Use – The BabyWombWorld baby monitor is SO EASY to set up! Most Wi-Fi baby monitors work with internet and set up is difficult. With the BabyWombWorld baby monitor there are no worries. You connect the camera to power and once you switch on the monitor unit you will automatically be connected. No hassle! No struggle! And adding more than one camera is a wonderful extra feature and just as easy to set up. Room Temperature and More – Room temperature is a very important factor when it comes to how well a baby sleeps. Especially if you use a baby sleeping bag. Just take a look at your monitor and you will be able to see the room temperature all the time! 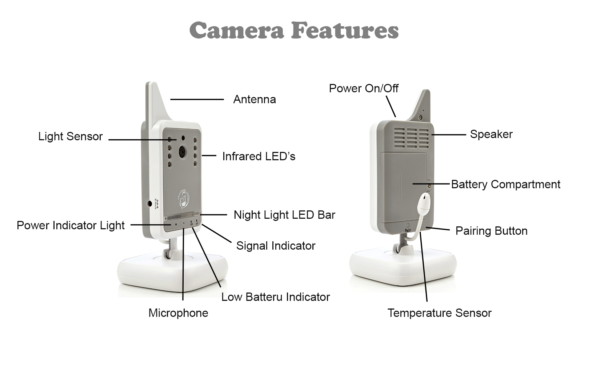 Both the monitor and camera has a lithium battery so you can use your camera and monitor for a period of time without having to plug any of the units into a power supply. But wait, there is more! – Although this unit only comes with one camera unit, you can buy up to three extra cameras and monitor all 4 of the cameras using the one monitor!! What should I do if there is no picture from the camera? Check all connections to the camera. Make sure the adapter is plugged in. Make sure that the camera and monitor are both on. Make sure that the camera is in range of the monitor. Make sure the camera and the monitor are paired. The picture is or has become choppy. What should I do? The picture may become choppy when experiencing a lower frame rate. First try to move the camera closes to the monitor. Otherwise try to remove obstructions between the monitor and the camera. The feeding alarm keeps ringing, how do I turn it off? Step 1: Locate the Feeding Alarm Button on the side of the monitor as per the photo below. Step 2: As you can see on the 2 photos below the alarm time is shown. Step 3: Press the Feeding Alarm Button (Refer to the “Step 1″ photo). You may to need to press it a couple of times to filter through these times (0:30 / 1:00 / 1:30 / 2:00 / 2:30 / 3:00 / 3:30 / 4:00) after about 7 clicks it will not show an interval time (See photo below) your alarm is now off. Strangulation Hazard!! – Keep the cord out of a child’s reach. NEVER place camera or cords within 3 feet of crib or playpen. Never use extension cords with AC adapters. Only use AC adapters provided. This product contains small parts that may cause choking. Keep small parts away from children. This product is NOT intended to replace proper supervision of children. You must check your child’s activity, as this product will not alert parents to silent activities of a child. NEVER use transmitter or monitor near water, including near a bathtub, sink, laundry tub, wet basement etc. This product is not intended for use as a medical monitor. Check reception regularly. Test monitor before use and after changing camera location. – Not hearing your baby when he/she cries in the other room? – How you can keep an eye on your little one when visiting friends – and he/she is sleeping in one of their rooms? – Whether the room temperature where your baby sleeps is to hot or cold? 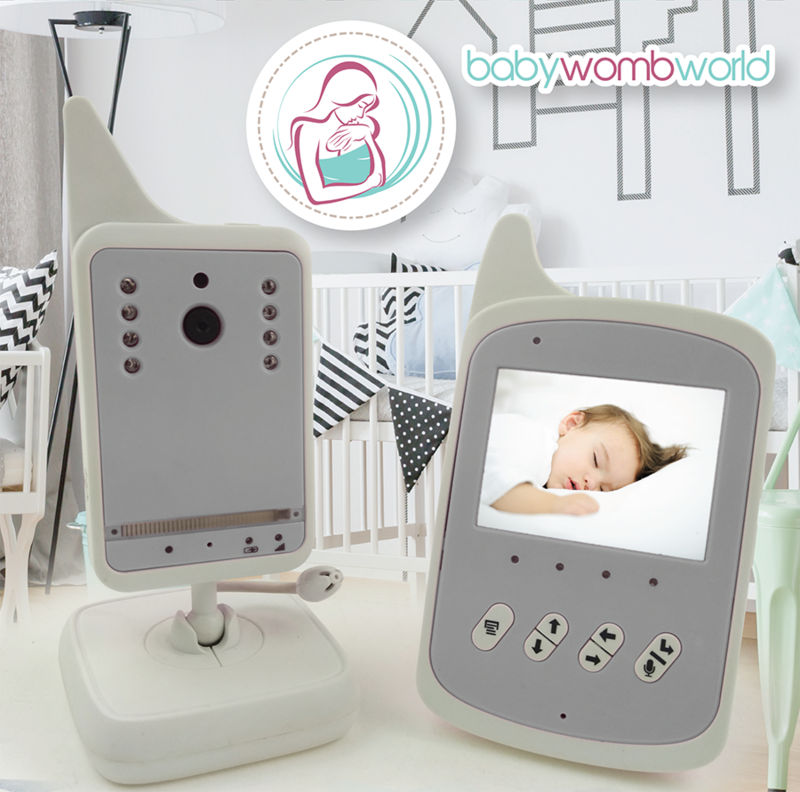 BabyWombWorld has designed a fantastic baby monitor that every parent should have! – No matter where you are in your house, you can now watch, listen and talk to your loved one anytime, all the time! Parents, you don’t have to worry or stress a minute more! Get your baby monitor now! This monitor is great. Has all the features you could ever need. High quality, extremely easy to use. Has 4 different music modes so you also don’t need a music maker to soothe the baby if you have this. Great picture, will also continue to use for security after I no longer need for baby monitoring. I have used quite a few monitors over the past 5 years. I have learned which features I feel are valuable (to me) and which I don’t care about. As soon as I received this item for review, I noticed how lightweight and slim the monitor was. The camera portion was also very light and small. I turned on both items and they were already partially charged. The picture was nice a clear and had good color when used in a bright room. The picture changes to a black and white style night vision once the room is dark enough. It picked up sounds well from the camera. 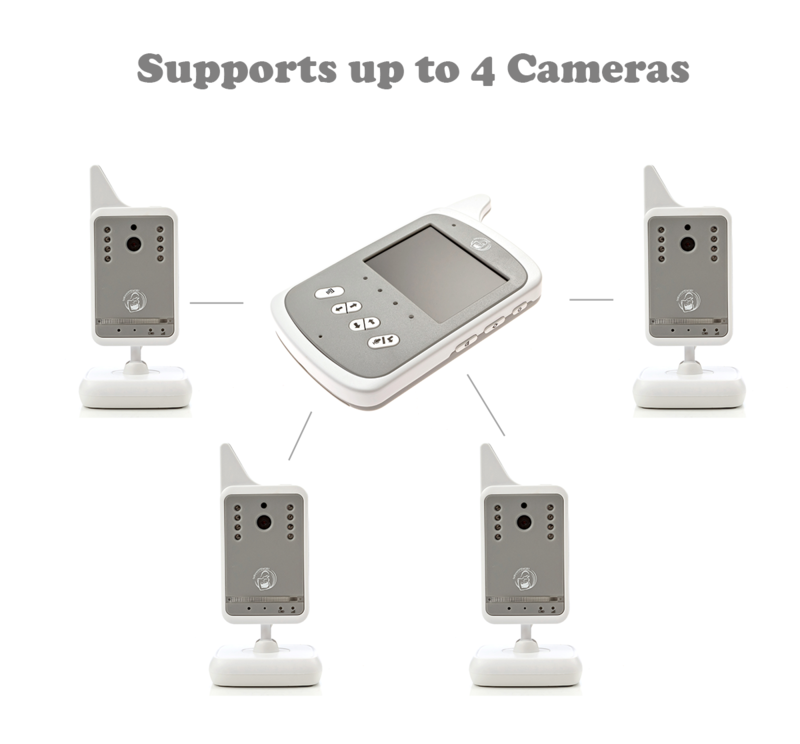 Being able to turn the picture on and off while still listening, the belt clip and pop out stand on the monitor, the volume control, the temperature reading for the room the camera is in, the talk feature so you can talk to from the camera to the room it is in, the ability to add up to 4 total cameras to same feed and the ability to unplug the monitor and take it with you as you move around. I don’t use the lullaby options, the amount of space that you can view is not large unless you put the camera up over an larger space and have smaller view of the people in the room and my biggest complaint is that it does not scan or pan. You are not able to move the camera from the monitor to see closer or more to the left or right. If you can go without the pan/zoom/scan features, I think this is a great little monitor. I know that I slept much better having the video monitor vs. the audio monitor. I also reduced the amount of times that I opened a door to check and woke a child with the motion. As an active mother, I hardly have time to keep a good eye on my child. I also work two jobs, so I needed all the help I could get. I decided to invest in this monitor strictly for all these reasons and then some. I also have a babysitter, who frequently checks up on my child–I can be a little too paranoid about the overall saftey and welfare of my child, so I thought this would be the best thing to sate my curiosity and paranoia. I have tried to purchased a few monitors in the past, all would break within seconds or some would just not function as properly as they claimed it would. I really love this specific monitor because it caters to all sorts of areas, aside from the video aspect of it. It also takes photos, you can program it to sing a “lullaby”, all sorts of very beneficial things for a working mother like me. I really love that this device is lightweight and slim, which is amazing. Considering some monitors that weighed a ton, this is very refreshing. Another key mention is that it comes per-charged. You can, always, charge it a bit more just to be certain but the whole device is already juiced up with enough power to last a while. The picture/video quality was crisp and clear. The color balance and saturation is amazing, very HD compared to other brands. The video/picture does change to black/white when it’s dark enough, so you can get a better look of your child in the darkness. You can basically turn the device on and capture photos or turn the picture mode completely off while still listening to the audio. It has a clip, a pop out stand, volume controls and temp reading. It also has a feature where you can talk to your child in a different room making it seem like you are right beside your child. It has the ability to hook up to 4 additional cameras without hassle, so you can have multiple children looked at, at the same time. I have used the lullaby options, which seem to work well for me. All in all, I highly recommend and approve of this product. I decided to purchase this monitor as a gift for my sister. She has just had her new child about a week ago and I thought this would make a great house warming gift for her and her newborn baby. I have, for the sake of this review, tested it out and made sure everything was in perfect working shape before I decided to wrap it all up and gift her with. The monitor works amazing, the quality of the video/picture is crisp and clean. I love the fact you can give your child a “lullaby” with that option on the device. It doesn’t pan, zoom or turn around but that is just fine considering the whole thing in itself is much more than I could have ever asked for! The audio is so nice and clear, no fuzzy or static sounds. I really love this device and I am sure my sister will too. I highly recommend and approve. I am very happy with and love this baby monitor. I used until now a reg. voice monitor without a camera. what should i tell you, you cant compare it, it bothers me why i didn’t have this earlier. 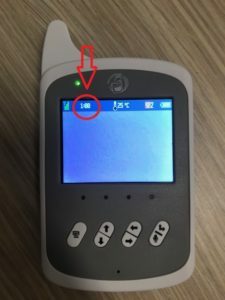 The monitor’s brightness level and volume level are adjustable. The screen display is clear in daylight and dark. The temperature feature plays an important role in monitoring the temperature of the room. I would highly recommend this for every mother. i’m definitely impressed with this baby monitor. here’s what i like: build quality- it feels kind of light weight, but still solid and the monitor feels ergonomic in your hand. the camera itself is pretty small and easy to fit on the furniture in my kid’s room. the fact that they’re both battery enabled is awesome. you can go camping or somewhere that you don’t have power and it will still work. there’s power saving features that would help it last all night. the menus are pretty easy to use but a quick look at the instructions help understand what each does. i like that you can play a lullaby from the camera to help sooth the baby. i have a 1.5 y/o and she didn’t want to nap…i put on the lullaby and it kind of snapped her out of her tantrum! awesome! two things i would change are the loud beep when you reach the end of options in a menu. i didn’t see a way to turn it off and it’s really obnoxious. the other thing is the battery life on the handheld unit. in a world where i’m used to all day battery on my phone and watch, etc. this thing only lasted a couple hrs. i wasn’t using the power saving features however so i’m sure it’s better if you use them. video and sound quality are awesome. all in all, a great product. Proud to have my Baby Womb World monitor! The video quality is great for the hand held monitor, I was impressed by the colors on the screen. The controls are easy to use and it even comes with a feeding timer for helpful reminders. Two way communication is possible by using the video monitor as a walkie-talkie and audio will play through the monitor automatically once the camera detects noise with its microphone. This package has one camera but the monitor can pair up to four. It’s convenient having a temperature gauge in with the baby, now we can keep an eye on the temp while in a different room. Each unit is capable of wireless function, you just plug in the AC adapter to charge. The hand held monitor holds a charge for a few days. When you are a new mom, you want to assure you can keep an eye on your little one at all times. This monitor works amazing and assures me that my child is safe. The monitor is made very well and is durable! I was excited to see how much we used this! This is an AMAZING baby monitor. I have looked and looked and it is so hard to find a baby monitor that has a backup battery to cover potential power outages and also to allow them to be portable if you needed to move them to a different location temporarily. Another unique characteristic of this monitor set is that it is so incredibly compact. The parent unit is smaller than most phones. Thin, lightweight, but still with a nice sized screen. The child’s unit is on a stand and can be tilted around to get the best view. 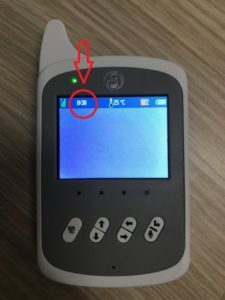 While using the monitor, you’ll find a lot of helpful features including temperature reporting (even alerts can be set to let you know if it gets too hot or cold), being able to speak to your child through the monitor, and play a number of soothing lullabies controlled by you on your parent unit. It has a lot of great features, obviously designed by moms and dads! The image is clear and I also appreciate being able to set a level of sound sensitivity so it will only kick on when there is something happening. This monitor is very high quality while also being affordable. I don’t know how they manage to do it! 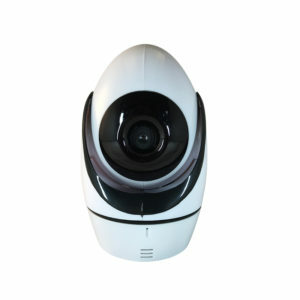 4′ LCD Display, Night Vision, Room Temperature Detection, and so much more. It’s been an absolute lifesaver! This is an amazing baby camera that has so many useful features. I love the way you can angle it so you can see your baby anywhere in the room. Also the ability to talk to your baby is so useful, my baby gets relaxed everytime i do it. I highly recommend this high quality product. This monitor is great! The voice and picture quality is amazing. I wish i was able to move the camera without having to do it manually, but it is such a great price! The ease of use is also a big plus. 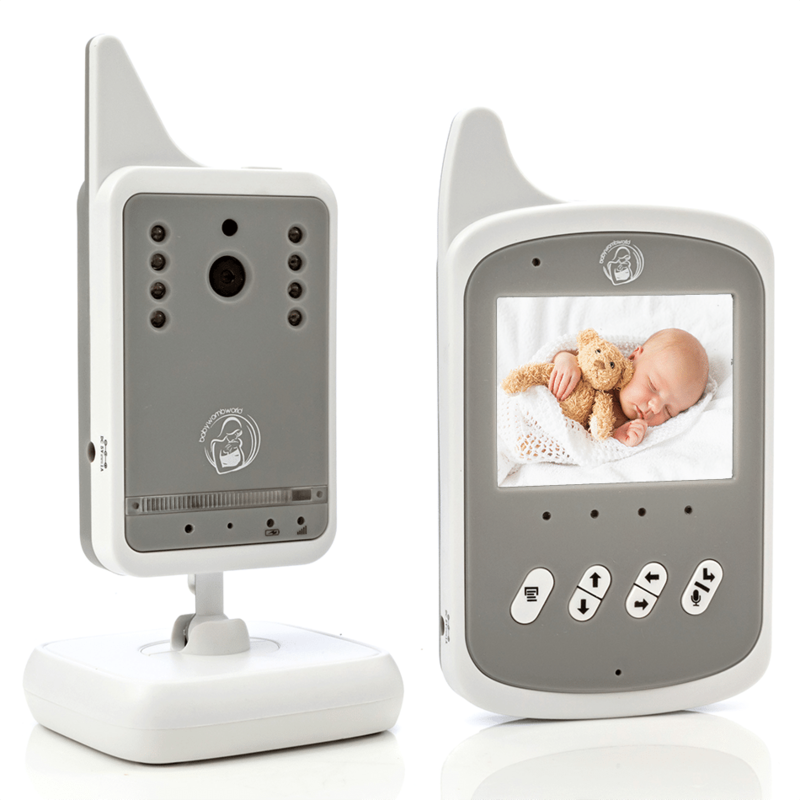 The features put this baby monitor leaps ahead of anything else in this price range! I give this 4 stars because the instructions are not very detailed so it’s up to you to figure out a lot of this on your own, and a few of the processes on it I’m having some issues figuring out. It syncs up very easy. When you turn the camera and the monitor on, they immediately start looking for each other and it took about 3 seconds total to connect. Video immediately began playing on connection. Video shows up in black and white whether I have a bright overhead light on or no light at all. That is one of the things I could not figure out. The instructions state if it’s not in color the lighting is not bright enough, but I don’t know that it could have been any brighter in my room. Either way, the video was extremely clear, audio was immediate and clear, and those were the main things I wanted. The menu is displayed on the monitor and takes a little figuring out to manipulate, but it does have a lot of options once you figure out how to maneuver through it. It will play a selection of 8 lullabies on a continuous mode, but they also play through the monitor. To shut them off on the monitor you have to turn the volume down, and then you cannot hear the baby. Overall it’s a great product, the little bugs I ran into weren’t the main reason for purchasing this, and the items I was most interested in work excellent. 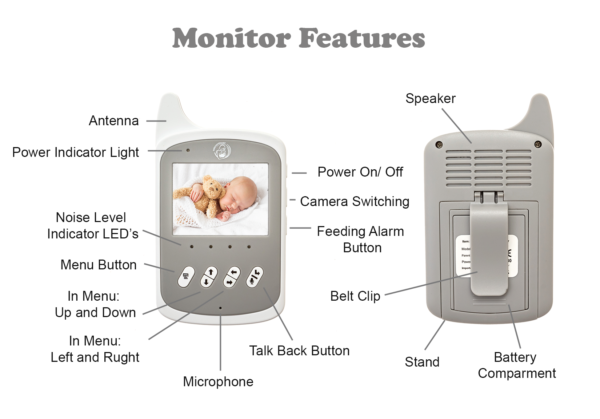 I like this baby monitor, wish the screen was a little bigger. Very beneficial for nighttime when you want to check on your little one but don’t want to get up. I only gave it four stars because the plastic packaging was broken and it almost hurt me when I was taking the product out. I gave this baby monitor 4 stars because the instructions could have been laid out better and there were also typos. But as far as the monitor goes i loke It. The picture is clear, i love the temperature indicator and also the clip on the back of the monitor so you can get stuff done and not worry about grabbing the monitor when you move rooms. This is a very powerful tool for keeping an eye on your child. It’s clear to me that in designing this, a lot of thought went into the nuances of keeping an eye on a specific location, and the result is a very effective product. The camera produces quality images, sound quality is decent, and temperature reporting is accurate (or at least in agreement with my thermostat). Night mode is really cool – the camera puts off plenty of IR light to illuminate what it’s aimed at. The system also has a rechargeable battery that lasts a few hours – it’s not intended to get you through a whole night without being plugged in, but it gives you the flexibility to watch some TV or get some chores done before you head to bed and plug it in for the night. Range is great – I walked mine about a full block away before losing signal (with the camera inside the house). Overall, you get everything you need for peace of mind from this system, with no added bloat (and thus, no extra cost). 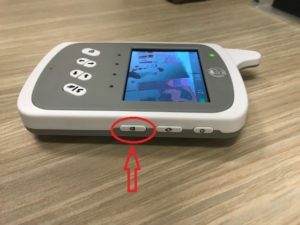 I did not test the lullaby features – apart from the fact that I don’t need this feature, the audio quality is good for communicating, but it’s not exactly my listening device of choice. I also didn’t test additional cameras (I only have one), but the monitor can accommodate up to 4 cameras per unit. Changing between seemed easy enough – hit a button and it brings up the next camera, just like flipping through the channels on TV. The monitor settings/options menu is a little overwhelming or confusing at first, but after some getting used to it was easy enough to work with. Monitor brightness is adjustable, though I’d like it to offer an even dimmer setting than the low currently offered (it’s not bad, but it would be better for sleeping to offer a dimmer option). Setup is super easy, as the devices automatically detect each other and work like walkie-talkies. While I feel this monitor already provides everything I need, there are two features I’d consider adding IF I were being extra picky. First, I’d like to see optional WiFi connectivity, though I’m aware that sort of defeats the purpose of this product. It would just be nice to have the option. The only other thing I’d like to see would be a push-button red flashlight on the monitor itself, for navigating a messy room during late-night feedings without waking myself up too much. Overall though, I’m very happy with this purchase and impressed with the way it handles everyday monitoring needs. This is an excellent product for its purpose. 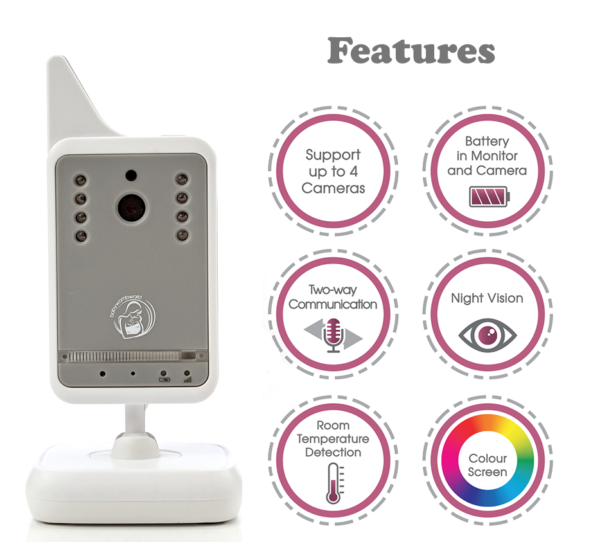 I couldn’t be more happy with purchasing this baby monitor from BabyWombWorld. As a soon to be first time parent – we are worried about getting the best of the best for our child. This product works exactly as advertised! One of the nicest features of this product is that both the monitor and camera have a battery so you can use this just about anywhere. The range also works throughout my entire house – having a large house I was worried that I would not be able to get transmission all over. But I was wrong! It also has a nice feature where you can see the temperature of the room – although this isn’t a make or break feature in my opinion. All in all a great product that will work for many years! I’m really liking this wireless baby monitor. It’s super easy to use and has wonderful picture quality. It’s super clear in night vision and color as well. The sound is great also. It comes with two chargers(only one shown) a camera and an lcd screen monitor. This has the option of playing 8 different lullaby’s and has two way communication. You can speak into the monitor which then comes out on the camera so baby can hear you. The battery life is awesome! The longest I’ve used it so far is about 6 hours without charging and it hasn’t died on me yet. The camera is adjustable so you can get it in the perfect position to see your baby. The monitor displays the room temperature which according to my home thermostat, is spot on. 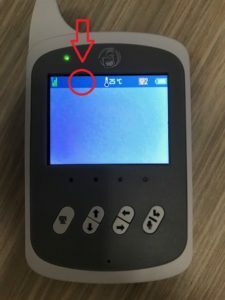 It has a high sensitivity microphone, which can be adjusted to lower the sensitivity so the monitor screen and sound turns on when baby wakes up or is making noise. This is a very nice quality monitor! I received this free in exchange for my honest and unbiased review. I received the BabyWombWorld 2.4″ LCD Digital Wireless Video Baby Monitor. It comes with a camera and an LCD screen that you can clip to your pants and walk around with. There is a square battery in it kind of like what comes in the newer cameras, so you can charge it and not have to leave it plugged in. Both the camera come with adaptors to plug into the wall. This set is very easy to use. Just plug it in and press the power buttons on both and they will turn on instantly. The LCD screen is very clear and depending on your lighting, the screen will be in color or black and white. The sound is very clear. Just don’t put near each other or you will get feedback sounds. The microphone is located behind the camera. You can press a button and talk back and forth with the person in the other room. You can also put on several different lullaby tunes for baby to hear without going into the room and interrupting. It can tell you the temperature in the room too in F or C. Overall, I really like this set. Very easy to use and good quality.